my journey to embodying my true, authentic self. How far along are we on the road to our dreams? Are we getting close to them? Or do those dreams always seem to slip further away from us? Do we still even believe in our dreams? Or are we losing our faith in them? As we look back on the year, what catches our attention? Do we choose to focus on what we haven't accomplished? Or do we cherish the challenges we encountered on our journey and our transformation along the way? Can we still feel like the same person without them coming true? Or would we feel like a failure? In the end, this is not about whether our dreams have come true or not. This is about us moving forward. About seeing the bigger picture and the breakthroughs we have made mentally, emotionally and spiritually. Some may see glimpses of new possibilities on the horizon, while others see broken dreams as their dead end destiny. How can we uplift ourselves when we feel like we are stuck in the rat race? Can we see broken dreams as our old paradigms being broken? Rather than only focusing on what we cannot do, do one small thing to make today better than yesterday. Begin to embrace our own version of simple happiness. Know that we can't compare happiness, because each person has their own concepts of happiness. What we see as happiness in another may not be the kind of happiness we want for ourselves in reality. In essence, we are both light and dark. We are positive and negative. Happiness and sadness are two sides of the same coin. Just remember who we truly are inside and start reaffirming our transformation! Can we see broken dreams as our old paradigms being broken? Happy New Moon! The Moon is joining Mercury Rx, the Sun and Pluto in Capricorn, marking a melancholy yet transformational New Moon in the sign of the mountain goat. By turning inward, we get a chance to discover what it means to understand our emotions. How can we know who we truly are without understanding the reasons behind our emotions? With the Moon conjoining Pluto, peeling the layers of superficiality is the theme of this New Moon. The more that we focus on outer labels, the less we are in touch with our deeper, inner selves. The more that we look outside of ourselves to create a sense of identity, the further away we get from really knowing ourselves. It is as though we have to reawaken something inside ourselves in order to embody our authentic truth. Embodying our authenticity means being grounded in our deepest beliefs, values and truth and living a life that is a true reflection of them. It is also about being true to ourselves through our thoughts, words and actions. Will we ever be perfect at honoring our own truth? No, but we can strive for excellence. It is mainly a matter of where we place our focus. the reasons behind our emotions? By holding the intention of being true to ourselves, we focus our attention on whatever resonates with our true, authentic selves. By doing more and more of those things that express our truth and less and less of those that do not, we learn to hold ourselves accountable for true authenticity and sincerity. Mercury Retrograde in Capricorn is all about recapturing the magic in honoring our power by expressing our voice. Release the need to prove our truth, because our experiences are ours alone, and they have shaped who we are. Let go of comparing ourselves to others and keep moving forward on our unique journey of authenticity. The Moon is forming a sextile to Mars and Neptune, and we have the power to propel our ideas forward and make things happen. Now is the time to act, because we can build momentum and make headway. As we remember that we are the co-creator of our reality and to a certain extent the shaper of our destiny, we can confidently stake our claim and get things done. The synchronicities and intuitive nudges we feel will help us see which way we are being pointed, giving us the confidence to charge ahead with Spirit as our guidance. confidently stake our claim and get things done. With the Moon's square to Uranus Rx and Jupiter, we remember that life is a series of ebb and flow. We all have positive and negative emotions. Self-realization is ultimately about realizing that we are human with real and raw emotions. It is important to see that our good and bad days mold who we are. When we feel guilty, ashamed, angry or sad, we are actually being redirected to becoming a catalyst for change. By accepting that negative emotions happen for a purpose, we can see a breakdown as a way to a new breakthrough. 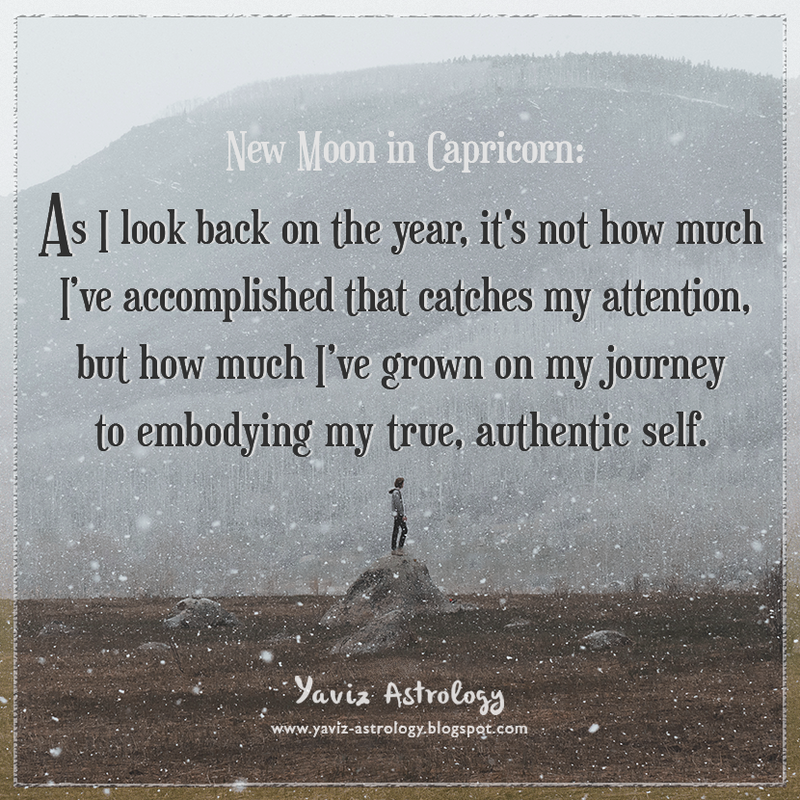 The Capricorn New Moon comes with a very deep and soulful message about our mission on earth and why we are here. The reason why we chose to come into a human body at this time is not only to accumulate material goods, acquire awards, praise or recognition. We have come here to help. And the greatest form of help is through sharing our light and love wherever we go. We may express this love through a career profession, and yet any career can be a vehicle for healing and empowering. And by holding this intention, we can activate our purpose and reawaken our soul's true potential. full of pain, hardship and sorrowful moments. define your character and your words define who you are. Who are we in our moments of joy, peace and love? Who are we in our moments of fear, worry and sorrow? Who are we when everybody's watching? Who are we when nobody's watching? There are many layers to life, and there are also many different roles we play over the course of our lifetimes. The way we think when we are joyful may be different to the way we think when we are sorrowful. The way we act around one person may be different to the way we act around another. The wisdom lies in recognizing the true purpose of each of those roles in our lives. And how one role can have an impact on other roles we play and how we are feeling. The deeper we get into understanding the different layers in ourselves, the more we realize just how much more there is to know about our soul. There are times when life can feel so complicated, and we wonder whether or not we are still the same person or believe in the same things. In many ways, we are, but with greater understanding about the workings of life and our never-ending self discoveries. Yes, life can be overwhelming. But if we open our eyes wide enough, we will see that life can also be exciting and full of learning opportunities. Are we acting from the soul and speaking from the heart? Or are we making decisions based on what we feel is wrong in our lives? Give ourselves the space to look closer into our joy. To look closer into our sorrow. There are endless discoveries to be found in our willingness to grow, and our openness to look beyond old, self-limiting beliefs. Begin to see pain not as an enemy, but as an old friend with endless wisdom to share. There are more layers to peel, and more magic to unleash. The possibilities are limitless. It's about time we greeted them with open heart. more there is to know about our soul. Happy Full Moon! The Moon in Gemini is forming an opposition to Saturn and the Sun in Sagittarius, marking a thoughtful and pragmatic Full Moon in the sign of the Twins. If we have been spreading ourselves too thin, or feeling overloaded with responsibilities, this is the time to pause and sort out our priorities. Are we getting caught up in our own perfectionism? Is there anything that could wait until later? What are our top priorities? Look for ways to unburden our schedules. Slowing down, being flexible and having a more playful attitude are necessary at this time. The Moon is forming a trine to Venus and Mars, and opening our heart to love has amazing benefits and blessings. With a mixed bag of energies from the Pre-Shadow of the upcoming Mercury Retrograde, let universal love open the door to our healing. Is it possible that we are too guarded with our hearts, which is blocking us from the flow of love in our lives? Empower ourselves to no longer deny our feelings or accept any form of emotional abuse. Begin the process of lowering any walls around our hearts, and let love free our minds. The Moon is also forming a trine to Jupiter, bringing to us another reminder of the power of positivity. Our positive outlook is a very powerful energy. There is a gateway energy opening, and our faith can powerfully increase the speed of our manifestations and answered prayers. Rather than attracting obstacles with a pessimistic outlook, we can improve any situation by attracting new possibilities with optimism. Taking part in the Grand Air Trine, Jupiter brings a message of hope and faith, and that there is always a positive way to speak our truth and share information. to speak our truth and share information. With the Moon's square to Neptune, we remember that with each experience, we learn more about ourselves. Our reactions and our patterns have opened the way to a deeper level of self-awareness. We can begin to understand the driving intentions in others and in ourselves, and how our motives define the nature of our experiences. As we understand our 'why' better, we can see whether we are motivated by the desire to serve and inspire, or whether we are driven by unresolved issues from our ego. Listen to the voice of our intuition, what does it tell us about our motives? The Moon is also making a sextile to Uranus Rx, and we are ready for something new. We have come to this point armed with new wisdom and knowledge, and we can sense a new phase of our life is about to begin. We can take action knowing that we are ready to step into our power, our light, and our service to the world. 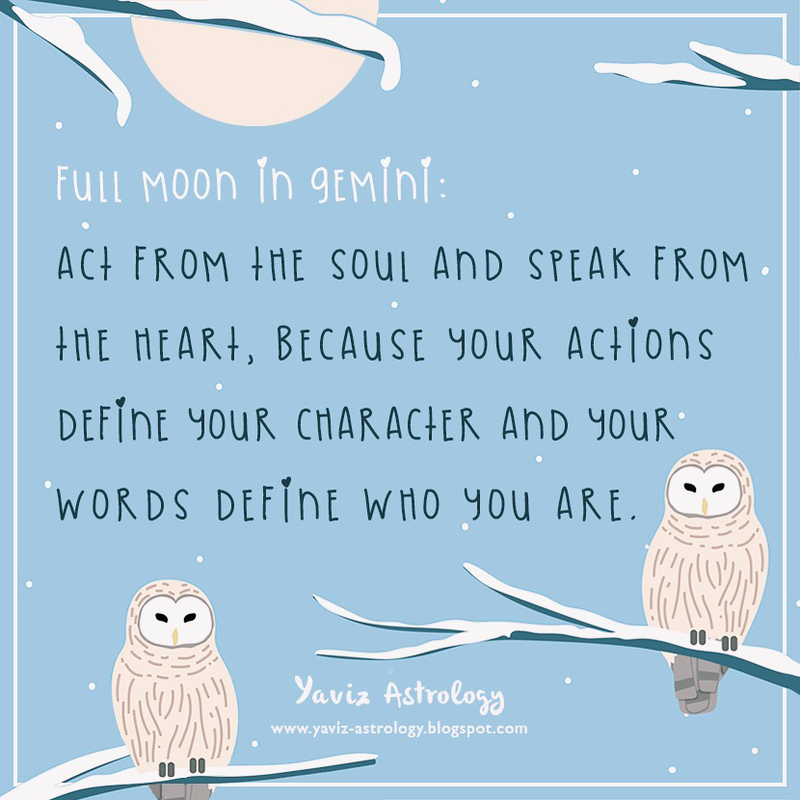 The Gemini Full Moon is shining a light on the direction we are moving in, and our soul is smiling with joy as we walk further down the road to our true destiny.